The Egerton family farm is located within the Berkshires of Western Massachusetts in the small rural town of Sheffield. The landscape of the Berkshire Taconic region is home to many ecological resources. The rural character is still intact and lack of existing urban development makes this area ideal for conservation opportunities. 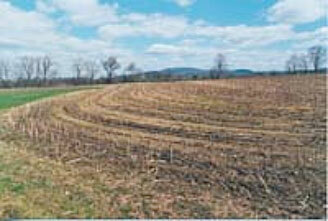 The Egerton farmland has been in agricultural use since the mid- 1700’s. Gavin and Helen purchased the Egerton Farm in 1968; here they raised four children Ann, Margaret, Joy, and Billy. 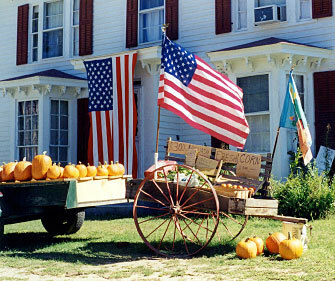 The family lived and worked on the farm where they tended animals and grew pumpkins and other vegetables. Traditionally the Egerton family sold their produce at their farm stand outside of the farmhouse that is adjacent to the rout 7 corridor. They have also for many years rented the majority of their agricultural lands to a neighboring dairy farmer for the Pine Island Dairy operation. The property consists of approximately 80 acres including an old farmhouse, large barn, grazing and crop fields, as well as a considerable portion of riparian corridor of the Housatonic River that is comprised of rich flood plain forests and wooded wildlife habitat. Sadly in 2003 both Helen and Gavin passed away within months of each other. Only their son Billy remained on the farm and continues to live on the property today. The four siblings wanted to provide for all their needs as the farm was left in trust for all of their benefits, yet the rising cost of maintaining the property became too much. Development pressures where strong as most of the surrounding land with frontage has been developed in the past ten year and the location of the farm is at the southern gateway of Sheffield’s business district. The family wanted to cooperate with one another and meet need for both farm and non-farm siblings, but they felt there were no other option but a traditional sale of the property. In 2006 the siblings where informed by their neighboring farmer and land renter about the Agricultural Preservation Restriction (APR) program conservation alternative, and were recommended to contact Sheffield Land Trust (STL). The neighboring farmer was familiar with both an APR as well as Sheffield Land Trust as he had recently acquired APR land from the Cavalier Farm to add to his Pine Island dairy operation. The APR program in Massachusetts was created almost thirty years ago and was one of the first states to develop a program to protect valuable and vanishing farms and farmlands. The landowners can access the equity of their land by selling the development rights to the state with out having to actually sell the farm while maintaining the agricultural land use of the property. The APR program is mainly funded by the state, yet it requires a match of 20% in local contributions. The value of the APR is determined by detailed appraisals that establish both the fair market value and the agricultural value, the difference between the two is the value of the APR. 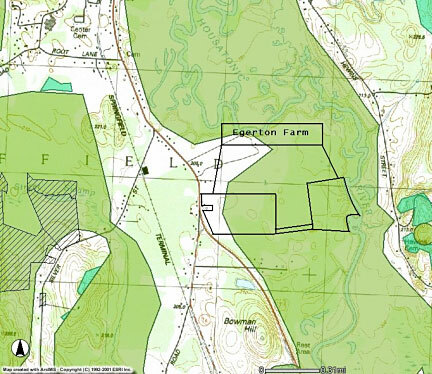 In 2007 the Sheffield Land Trust helped the Egerton siblings facilitate the APR transaction. STL aided the Egerton’s in the application process, acquiring appropriate appraisals, in addition to providing technical expertise including maps. STL also helped the Egerton’s to raise the required local contribution funds, but before they could meet their finical goals the state was ready to close on the deal. STL contacted the Open Space Institute (OSI) for finical assistance, and they where able to supplement the $138,000 towards the community funds in the form of a loan to STL. The Egerton family was able to save their farm through the help of STL, the use of a sate APR and a loan from the Open Space Institute to offset the cost of community contributions until adequate funds could be raised. This transaction allowed the Egerton’s to retain the farm and meet their financial requirement by reducing property taxes, and providing estate tax relief of income tax on their inheritance. A total of 67 acres was preserved under the APR and continues to be used, as agricultural land rented by the neighboring Pine Island Farm. In addition several acres of the property will remain as a vital riparian buffer along the Housatonic. Billy and his wife Donna still live on the farm on a plot carve out of the parcel including the old farmhouse and barns and hope to continue with the family’s tradition and revitalize the farm stand. 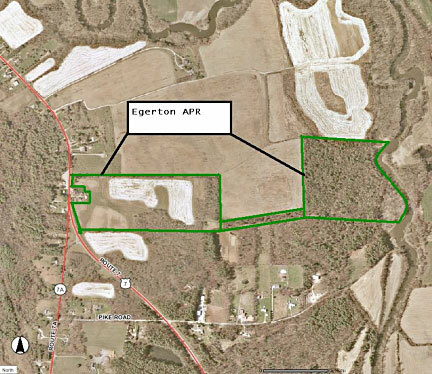 STL has not yet reached its funding goals for the Egerton property although they are well on their way to achieving it. The Egerton case is about farms and families that choose to protect the existing landscape of western Massachusetts. Choosing to preserve and utilize prime existing agricultural land is essential to the sustainability and vitality of our communities while also preserving the cultural characteristics of place. It demonstrates how neighbors can help provide information to landowners about land conservation options. The project also demonstrates how partnerships can be beneficial towards everyone’s interests. There are many options in conservation that can be valuable to meet a diversity of needs and situations and provide real alternatives that can converge both financial and conservation objectives. Friends and neigbors can play a critical role in connecting landowners deciding the future of their land with information about their options and local contacts to help landowners make an informed decision.. There are many options in conservation that can be valuable to meet a diversity of needs and situations. A partnership like the Egerton case demonstrates how collaborations can be beneficial towards everyone’s interests. Even smaller parcel of land (< 100 acres) like the Egerton Farm contribute significantly and perform key functions in regional conservation goals like greenway development. Choosing to preserve and utilize prime existing agricultural land is essential to the sustainability and vitality of our communities while also preserving the cultural characteristics of place. Gavin and Helen Egerton bought the farm in Sheffield Massachusetts, where they raised four children and worked the family farm. The Egerton farm was left in trust to all four children after both Gavin and Helen passed away within months of each other. The children Ann, Margaret, Joy, and Billy decided that the only way to provide for all their needs was to sell the farm. Siblings where informed by their neighboring farmer and land renter about an Agricultural Preservation Restriction (APR) conservation alternative and were recommended to contact Sheffield Land Trust (STL). In June STL helped the Egerton Family save the farm by using multiparty efforts including an APR through the Department of Agricultural Resources, and a loan provided by the Open Space Institute (OSI) to substitute the required 20% community contribution until adequate funds could be raised. STL is raising funds to reach their goal of attaining $147,000 in community donations to pay off the loan and interests.